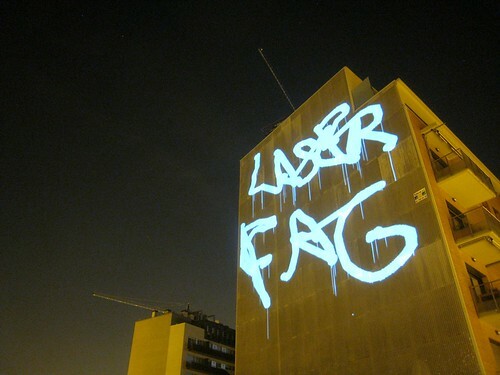 Hacked Gadgets :: View topic - Using 405 nm laser pointer to draw pictures, write letters. Using 405 nm laser pointer to draw pictures, write letters. Posted: Thu Aug 07, 2008 8:28 pm Post subject: Using 405 nm laser pointer to draw pictures, write letters. How to use a laser pointer to draw, to write and to record it? I think it is a very interesting thing. With the help of a camera with the function which could set longer exposure time,you could easily record what you draw and write with the laser pointers.The laser pointers include 405 nm blu-ray laser pointer, 532 nm green laser pointer, 473 nm blue laser pointer, 593.5 nm orange laser pointer. This is one of the photos. The color of the images looks great! Thanks for sharing. Posted: Fri Aug 08, 2008 7:41 am Post subject: Sooooo Oldddd..
We were doing that 15 years ago. Not new, but still very cool. And the sun sets on Pentium Prime, hopefully to rise again. This technology of taking photogragh is old. But the laser pointers we use are new. And this video using so many colors of laser pointers. How about this on GITD tiles. That looks real cool. What was the process to make it? Are you shooting at some material that retains the light? Or is it all done in post video processing? There is some video about this you could see on youtube http://www.youtube.com/watch?v=tEnPrsaFNEo, I want to share a very nice page with you. http://www.cnilaser.com/Industryoverview/Industryoverview080807_1.htm, It is very helpful to choose a laser pointer. That was one cool project! That's real time video. The only video processing was to reduce the file size. so you can draw on glow-in-the-dark material, check out here.